Stepping into the station itself would somehow take you back in time, the atmosphere being one which seems more at home in the Singapore of the 1960s and 1970s. The large airy concourse that greets the visitor is adorned with mosaic murals that speak of a style that was prevalent of a time we have left behind and depict scenes from the Malayan peninsula that would have been more common in that era. Over the years that I had have an awareness of the layout of the concourse, nothing much has changed except perhaps that the occupants of some of the spaces, and an invasion of a Tourism Malaysia hut in the middle of it. It is in one of the spaces along the concourse that some nice food can be found and to perhaps add a old world flavour to the station, you would find food vendors that would be more comfortable conversing in Bahasa Melayu, once a common language on the streets. The sight of the trains at the platforms of Tanjong Pagar will soon be nothing but a fading memory. Beyond the concourse, the platforms do also take one back in time. With a cafe where one can sit back and enjoy the comings and goings on the tracks as well as on the platforms, over a cup of tea that perhaps one would bear only for the pleasure of what the setting offers. These days with the knowledge that the station would soon hear its last train whistle, one would encounter an army of photographers that sometimes seem to outnumber passengers making their way from the platform. Across on the departure platform, for long missing the Singapore checkpoint staff that had occupied the rooms at the end for some three decades before moving to Woodlands during a time when relations between Singapore and the northern neighbours wasn’t at its best. Somehow, the frenzy that accompanies the checkpoint on the Causeway is also missing from the Malaysian Customs and Immigration counters on the platform. Last light … the light is fading on the train station as it will hear its last train whistle by the time the first of July comes around. Beyond the platforms, the highlight for any train passenger awaits, one that takes one through parts of Singapore that have remained untarnished by the waves of development that has altered the face of much of the island, and it is for this that a train journey through Tanjong Pagar is certainly worth the while. The initial part of the journey through to the Bukit Timah area past the two truss bridges cuts through some parts that might well have remained untouched since the Railway Deviation of 1932 took the railway line through the Ulu Pandan area to Tanjong Pagar. There are huge tracts of greenery, particularly in the Buona Vista / Portsdown and Ulu Pandan areas, much of which are certainly worth keeping – something that the Nature Society of Singapore advocates in their proposal to turn the rail corridor into green corridors. Unfortunately, it does seem like the vultures have started to hover over some of these places based on the Foreign Minister’s mention of plans during the budget debate on 3 Mar 2011. Beyond the station at Bukit Timah, there would also be parts where the original Singapore to Kranji line would have run up to 1932. And it is along these stretch that we see some of the parts of the railway that fascinated me from my early days, including the bridges and the level crossings that we might soon see the last of, as come the first of July, the railway line that we have seen cut through Singapore for a century or so, would see its last train. 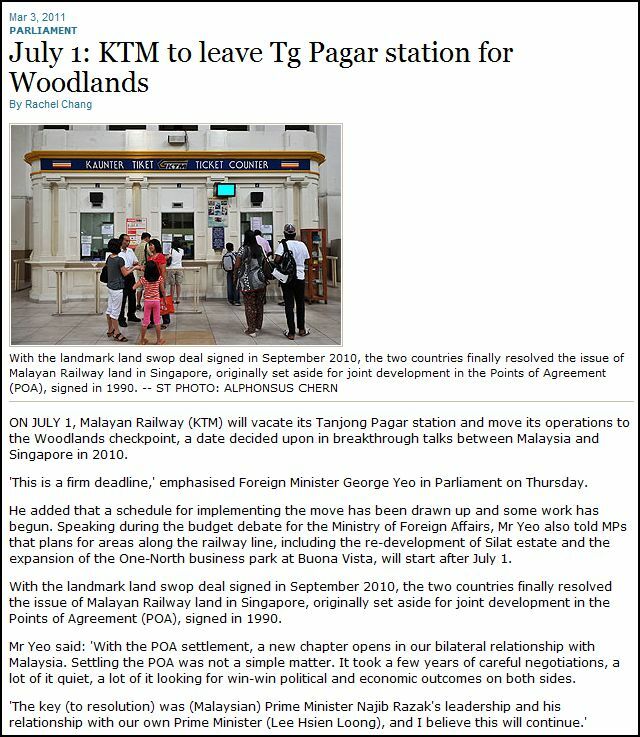 Foreign Minister George Yeo on the schedule for the shift of the terminal station from Tanjong Pagar by 1 Jul 2011. Nothing new in the announcement except that some of the development plans for the railway land were mentioned. The departure platform again. Not having had enough of journeys through Tanjong Pagar, I found myself on the platform taking another journey. So, there I found myself on a Sunday morning with a few companions, boarding another train, to embark on what is perhaps not a final but one of my last journeys out of the station, taking it all in again. The view from the train pulling out from the sunrise shrouded station was dreamy to say the least, as were the views of the train yard, somehow feeling as if it was a movie of a forgotten time that I was watching. I took it all in … signal poles, distance markers, the green tracts, the Tanglin Halt area which I had been familiar with having spent my earliest days in nearby Commonwealth Crescent, that old station at Bukit Timah, the truss bridges and the level crossings. The train ride went a little too smoothly for it to be one that I was used to, leaving right on time and speeding past the station at Bukit Timah and skipping the ritual of the exchange of the key token. We were to find out why once we got across the Causeway … that I would leave to another post, as I will our destination for the day … this journey certainly won’t be my last and if I do have the time … it would be one of a series of journeys that would be to remember that we once had an old world railway line running through a Singapore that had long left that old world behind. Pulling out of Tanjong Pagar. A fading memory … the view out of the window of a train passing through Kranji area.